This is a great coat for cold weather! Go up a size if you want it roomy enough to wear more layers underneath. 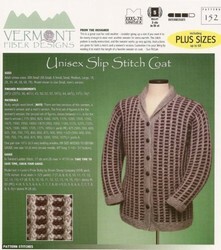 The stitch pattern is easily memorized, and the sweater works up very quickly in bulky yarn. Thirteen sizes from XXXSmall through 7XLarge, with both men's and women's versions. Laurel's note: I have to admit that the colors chosen for this photo are not my favorite, but I'd urge you to close your eyes and imagine the coat in something right for you or the intended wearer. My oldest son would probably like this in a dark grey with the checks and edging in black--very subtle. For myself I'd be tempted to use a brightly colored variegated yarn with black checks and edging. Uses bulky weight yarn, knit at 3 st/inch on size 10 1/2 needles in stockinette (17st = 4 inches in pattern). 13 sizes, XXXS-7X takes between 775-1850 yds main color AND 475-1075 yards contrast color. Finished chest sizes from 28.5-76 inches.